Potato is eaten cooked as a vegetable, boiled, baked (often jacketed), mashed or as chips (French fries). Potato is a frequent ingredient in soups, stews and pies. In Italian cuisine, gnocchi are made from potato. Potato is also eaten cold as a salad, possibly in coleslaw. Crisps (chips) are eaten as snacks. However, potato can found as a hidden allergen when dried cooked potato is used as a thickener or added to flour. Potato is considered a rarely allergenic food and is frequently used in elimination diets and as part of the placebo in challenge protocols. However, more than 50 cases of food allergy after eating cooked potato have been reported and skin prick tests suggest that sensitization to raw potato is relatively common. Cases of contact allergy to raw potatoes have also been reported. The symptoms reported include reactions of the skin such as urticaria (hives), angioedema (wheals) and eczema, respiratory symptoms such as rhinitis, cough and wheezing and gastrointestinal symptoms such as vomiting and diarrhoea. Most reactions occurred within 2 hours (immediate reactions) but delayed reactions have also been reported. Allergy to cooked potato is related to tomato allergy and to latex allergy. Sensitization to raw potato may also be related to pollen allergies. Urticaria, angioedema, eczema, rhinitis, vomiting and gastrointestinal symptoms such as loose stools and diarrhoea (Castells et al. 1986 ). Raw potato (Dreborg and Foucard, 1983 ; Seppälä et al. 1999 ; Majamaa et al. 2001 ). Purified patatin (Sol t 1) (Seppälä et al. 1999  and 2000 ; Majamaa et al. 2001 ). SPTs were performed with a commercial potato extract and with homemade extracts of cooked and raw potato cv Bintje and Charlotte. Briefly, pieces of potato bulb were put in diacetone alcohol (50 g/100 mL) for 10 minutes at –20°C, before 150 mL of precooled acetone was added. The mixture was kept overnight at –20°C. The precipitate was rinsed at 4°C twice with acetone and once with acetone/ether (1:1) and then left to dry. The resulting powder was then dissolved in distilled water for 1 hour at 4°C while stirring. After centrifugation for 45 minutes at 12,000g, the supernatant was divided into 2 parts. The first part was filtered through a 0.45-µm membrane, placed in aliquots, and kept at –20°C until use. This part was referred to as the noncooked potato extract. The second part of the extract was boiled for 5 minutes and then cooled at room temperature before filtration through a filter paper (Whatman no. 1) and a 0.45-µm membrane. Aliquots were stored at –20°C until use. This part was referred to as the cooked potato extract (De Swert et al. 2002 ). Skin prick tests were performed by the skin prick technique. (Dreborg and Foucard, 1983 ). The prick-prick technique was used to test raw potato, and the ordinary skin prick technique was used to test purified patatin (concentration,100 µg/mL) on the volar aspect of the forearm by using histamine dihydrochloride (10 mg/mL,ALK) as a positive control and physiological saline as a negative control (Seppälä et al. 1999 ; Seppälä et al. 2000 ). The SPT was read after 15 min and recorded as positive if the mean diameter of the wheal was at least 3 mm and the negative control caused no reaction (Majamaa et al. 2001 ). 1 mg/ml of histamine diphosphate was used as a positive control and Coca solution in 50% glycerol was used as a negative control. An SPT response was considered positivie when the mean wheal diameter was 3 mm greater than that porduced by the negative control (De Swert et al. 2002 ). 174 children of whom 128 suffered from pollen allergy (Dreborg and Foucard, 1983 ). Sera were obtained from 27 children (mean age, 4 years; range, 4 months to 10 years) examined for food allergy who had atopic dermatitis, asthma, or allergic rhinitis (Seppälä et al. 1999 ). 39 children (Seppälä et al. 2000 ). 12 atopic infants (six girls, six boys; mean age 13 months, age-range 10-24 months), who were suspected of allergy to potato based on a clinical history (Majamaa et al. 2001 ). 7 children suspected of having allergy to cooked potatoes (De Swert et al. 2002 ). Positive SPT results were obtained almost exclusively in children who were SPT positive to a birch pollen extract. Children who noticed clinical symptoms when eating apple, raw carrot or potato were found to have a significantly larger SPT reaction than children with a negative history of reactions to these foods (Dreborg and Foucard, 1983 964]). 8 children had a wheal response (3 mm in diameter) to purified patatin and 9 children to raw potato (Seppälä et al. 1999 ). 2/4 infants and 1/4 older children had a positive SPT response to Sol t 2 (20 µg/ml). All 4 infants and 2/4 older children had positive SPT responses to Sol t 3.0101 (40 µg/ml). Positive SPT responses to Sol t 3.0102 (40 µg/ml) were seen in all 4 infants and 1 older child. 2 infants and 2 older children had positive SPT responses to Sol t 4 (20 µg/ml). All 8 children tested had a positive response to raw potato, and 6/8 did so to Sol t 1. The 6 control children all tested negative for those foods/allergens (Seppälä et al. 2000 ). 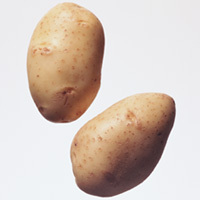 7/12 infants had positive SPTsto raw potato and 1 was positive to cooked potato. SPT with Sol t 1 was positive in 6 infants (Majamaa et al. 2001 ). All 8 patients had a positive SPT response to cooked potato extracts from one cultivar; with 2/8 patients having positive responses to a concentration of 50 µg/mL. The same 7 patients also had a positive SPT response for raw potato extracts for both cultivars. SPT responses with the commercial extract were positive in all patients. The control group children all tested negative with 50 and 500 µg/mL of the cooked potato extracts. Of the 8 control subjects tested with the raw potato extracts, one girl had a positive SPT response for the highest concentration of Bintje cultivar. That same child was the only one of the 9 control subjects with a positive SPT response to the commercial extract (De Swert et al. 2002 ). Gel filtration chromatography fractions of potato extract. Fraction I: 10-20 kDa, fraction II: 20-30 kDa, fraction III: 30-40 kDa, fraction IV: 40-50 kDa, fraction V: 50-60 kDa, fraction VI: 60-70 kDa and fraction VII: 70-80 kDa (Wahl et al. 1990 ). Purified patatin (Seppälä et al. 1999 ). Purified allergens: Sol t 1, Sol t 2, Sol t 3.0101, Sol t 3.0102, and Sol t 4 (Seppälä et al. 2000 ). RAST and histamine release from basophils (Wahl et al. 1990 ; Seppälä et al. 1999  and 2000 ). CAP values of greater than 0.35 kUa/L were considered positive (De Swert et al. 2002 ). 10 children with immediate hypersensitivity reactions (Wahl et al. 1990 971]). 8 patients showed a positive histamine release to at least one fraction of potato extract. There was no significant difference for basophil reactivity and sensitivity between the different fractions and the patients demonstrated variations in their sensitization to potato allergens. All the sera had RAST classes 2-4 (7.6-46.5% binding) (Wahl et al. 1990 ). 20 of 27 (74%) atopic children showed ELISA values that exceeded the mean +3SD of 44 control children for patatin (Seppälä et al. 1999 ). 9 patients showed a positive RAST. In ELISA analyses, 4/5 infants challenge-proven potato allergy showed a moderate decrease in their IgE antibody levels to Sol t 1 after maintaining a potato-free diet for 6 months, whereas 1 child showed a striking increase in the IgE antibody level (Majamaa et al. 2001 ). Results ranged from 3.71 to greater than 100 kUa/L. In the control group potato CAP results were negative in 5 of 6 children, with 0.49 kUa/L of IgE in one girl (De Swert et al. 2002 ). Proteins were separated by SDS-PAGE in 3-22% agarose gels (Wahl et al. 1990 ). Proteins were separated by SDS-PAGE in 15% polyacrilamide gels under reducing conditions (Seppälä et al. 1999  and 2000 , Majamaa et al. 2001 ). SDS-PAGE was carried out in 13% polyacrylamide gels with 5% stacking gels under reducing conditions. (De Swert et al. 2002 ). For immunoblotting experiments, SDS-PAGE–separated proteins were transferred onto nitrocellulose membrane. The membrane was incubated with patient control sera (diluted 1:5 v/v), then with 125I-anti-human IgE (Wahl et al. 1990 ). For immunoblotting experiments, SDS-PAGE–separated proteins were transferred to a polyvinylidene difluoride (PVDF) membrane. The PVDF membrane was incubated in a blocking buffer containing 5% (w/v) nonfat milk powder and then transferred into a Miniblotter. The membrane was again incubated with patient and control sera (diluted 1:5 v/v) and then with biotinylated goat anti-human IgE antibodies diluted 1:1000 (v/v). Streptavidin-conjugated alkaline phosphatase diluted 1:24,000 (v/v) was added. After washing, the membrane was placed in a color development solution (Majamaa et al. 2001 ; Seppälä et al. 1999  and 2001 ). For detection of IgE-binding, the membrane was placed in Immune-Star Substrate development solution, and bound IgE was visualized using Hyperfilm, high performance chemiluminescence film (Seppälä et al. 2000 ). Separated proteins were transferred onto a polyvinylidene difluoride membrane . The membrane was blocked in 0.2% (w/v) defatted dried milk before overnight incubation in patient serum. After washing, bound IgE was detected with mouse anti-human IgE mAbs, followed by peroxidase-conjugated rat anti-mouse kappa light-chain antibodies. (De Swert et al. 2002 ). Sera showed IgE binding to proteins between 16 and 30 kDa, and 43 and 65 kDa (Wahl et al. 1990 ). Immunoblotting showed strong IgE binding to a 43-kDa protein, identified as patatin (Sol t 1) (Seppälä et al. 1999 ). 58% of sera showed IgE binding to a 20-kDa band and 25% to bands in the 16- and 18-kDa regions (Seppälä et al. 2000 ), whilst 58% of sera studied by Majamaa et al. 2001  showed IgE binding to Sol t 1. Seven sera recognized a double protein band of about 40 kDa. Serum IgE from a single individual recognized only this band. IgE from five sera recognized a protein band in the range of 17 to 18 kDa, and for one serum this was the only protein band that was recognized by IgE. Protein bands of approximately 14, 16, 20, 23, and 25 kDa were recognized each by 2 different sera. One serum containing IgE which also recognized a protein band of approximately 60 kDa, whilst IgE in another serum also recognized protein bands of approximately 27, 38, and 85 kDa, respectively. In the control group IgE immunoblots from SDS-PAGE patterns of potato extract were negative in 8 of 8 sera (De Swert et al. 2002 ). Open potato challenge was started by rubbing both raw and cooked potato (Solanum tuberosum cv Bintje) for 30 s on the volar aspect of the forearm, and the exposed skin was observed for 20 min for any reaction. (Majamaa et al. 2001 ). The challenge was carried out with cooked potato applying a small amount at the inner side of the lower lip. (De Swert et al. 2002 ). Blind:No (Majamaa et al. 2001 , De Swert et al. 2002 ). Twelve atopic infants (six girls, six boys; mean age 13 months, age-range 10-24 months), who were suspected of allergy to potato based on a clinical history (Majamaa et al. 2001 ). Oral potato challenge was performed by giving the infant, at 30-min intervals, increasing doses of cooked potato until one medium-size potato had been eaten. If no reaction occurred within 4 h, the challenge was continued at home where the patient ate one to two cooked potatoes each day. If no reaction occurred, the final examination was performed on day 7. Dose response was one spoonful of cooked potato (Majamaa et al. 2001 ). The challenge was carried out applying a small amount at the inner side of the lower lip. If no reaction occurred after 15 minutes, it was continued with doses of 5, 10, 20, 40, and 45 g of potato, respectively, given at 15-minute intervals until appearance of characteristic symptoms or until reaching the total dose of 120 g of cooked potato consumed. This is the equivalent of 2 medium-size potatoes. 3.5-25 g depending on the patient (De Swert et al. 2002 ). A 18-kDa component appears to cause the IgE cross-reactivity observed grass pollen, potato and fruit (Calkhoven et al. 1987 ). A common band of 44-46 kDa could be implicated in the high IgE cross-reactivity between tomato, latex, and potato observed in the immunoblot and CAP inhibition (Reche et al. 2001 ). Cross-reactivity between the latex allergen Hev b 7 and patatin was primarily restricted to latex-sensitized adults, suggesting a different mechanism of sensitization in children with atopic dermatitis (Schmidt et al. 2002 ). The Allergen Nomenclature Committee recommend the name Sola t 1 rather than Sol t 1 to avoid the possibility of confusing potatoes with fire ants (Solenopsis). Thus the names Sol t 1, Sol t 2 etc. used in the articles should be changed. Identification of paptatin as a novel allergen for children with positive skin prick test responses to raw potato. Allergy to apple, carrot and potato in children with birch pollen allergy. Wahl R, Lau S, Maasch HJ, Wahn U.
Seppala U, Majamaa H, Turjanmaa K, Helin J, Reunala T, Kalkkinen N, Palosuo T.
Identification of four novel potato (Solanum tuberosum) allergens belonging to the family of soybean trypsin inhibitors. Process, chemical, enzymatic:Heat-labile at 50°C (Pots et al. 1998; Koppelman et al. 2002). The authors concluded that the heat lability of patatin-IgE interaction is explained by aggregation of patatin with other potato proteins rather than by denaturation of patatin itself. Nature of main cross-reacting proteins:Seppala et al., 2000 described in vitro cross reactivity to Hev b 7, latex allergen and Kostyal et al 1998; Sowka et al 1998 determined the sequence identity to be 40%. Allergen properties & biological function:Patatin (previously referred to as tuberin) is the main storage protein in potato tubers. Although its physiological role is not entirely understood, its lipid acylesterase activity may indicate a role in the plant defense system. Allergen purification:Proteins in homogenized pulp of potato tubers were precipitated with ammonium sulfate and first subjected to gel filtration on a Superdex 75 Fast Flow column. Anion-exchange chromatography was then performed in a Mono Q HR5/5 column. Fractions eluted from this latter column were applied to a Octyl Sepharose 4 Fast Flow column and subjected to hydrophobic interaction chromatography (HIC). For a final purification step, the immunoreactive fraction from the HIC was subjected to reversed-phase chromatography in a TSK-250 TMS column. The result was one peak, which in SDS-PAGE and immunoblotting appeared as a double 43 kdDa band. Amino-terminal sequence analysis of each of the two bands revealed a similar sequence corresponding to patatin (Seppala et al 1999). Sola t 1 is a glycoprotein. The 3D-structure of the closely related patatin from heartleaf nightshade (Solanum cardiophyllum) is available 1OXW. Cloning and characterization of a latex allergen (Hev b 7): homology to patatin, a plant PLA2. cDNA cloning of the 43-kDa latex allergen Hev b 7 with sequence similarity to patatins and its expression in the yeast Pichia pastoris. Seppala U, Palosuo T, Seppala U, Kalkkinen N, Ylitalo L, Reunala T, Turjanmaa K, Reunala T.
IgE reactivity to patatin-like latex allergen, Hev b 7, and to patatin of potato tuber, Sol t 1, in adults and children allergic to natural rubber latex. Seppala et al. 2001 suggested that it is likely that these proteins are thermostable since protease inhibitors are known to have a stable conformation. Nature of main cross-reacting proteins:Sol t 2, Sol t 3 and Sol t 4 show IgE cross-reactivity since they are homologous to the Kunitz type trypsin inhibitors of soybean but no cross-reaction has yet been reported with the latter protein. Sol t 2 is a cysteine protease inhibitor which is thought to have a role in plant defense.